It’s Week 3 of the preseason. This is the time of year where we typically start seeing fantasy leagues start scheduling their drafts. 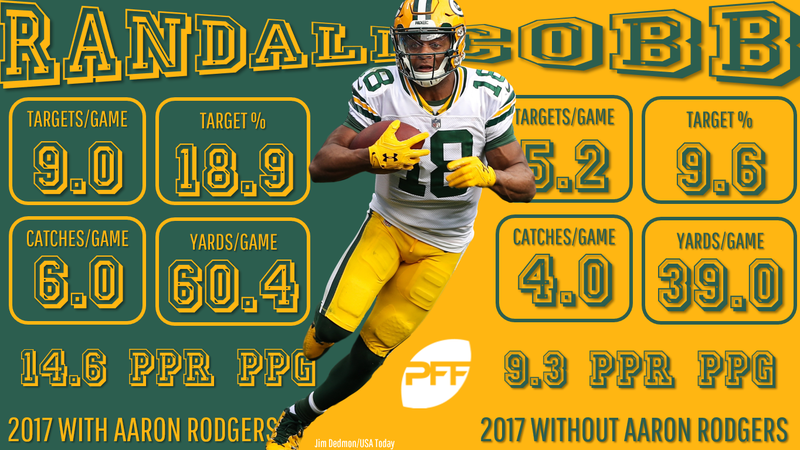 If you’re just now awaking from the offseason slumber, PFF Fantasy has verything you need to catch up and get ready for your upcoming fantasy drafts. While we never recommend heading into a fantasy draft with a predetermined strategy (you should be willing to adapt, otherwise you miss out on terrific player value), sometimes the board falls to you in a particular way that it’s prudent to start with a running back-heavy approach. There’s no need to fret if you follow your draft board and find yourself with three running backs after the first three rounds. This year the wide receiver position is deeper than ever, providing plenty of mid- to late-round wideouts you can draft to win your league. Let’s take a look at some of these top wide receiver options that could help you dominate your league. Current average draft position is taken from FantasyFootballCalculator’s 12-team PPR settings. Over the past three seasons combined, Crabtree has accrued the 14th-most PPR points of all wide receivers and the fifth-most touchdowns during that span (25). Chasing touchdowns can be a volatile venture, but only Antonio Brown, Doug Baldwin, DeAndre Hopkins, and Odell Beckham Jr. surpassed Crabtree’s 25 touchdowns over the past three years. Entering the offense with the most targets and air yards available, there’s a huge opportunity for Crabtree to capitalize and finish as high-end top-24 wideout in Baltimore. The addition of Watkins to the Chiefs makes Kansas City one of the most well-rounded offenses heading into 2018. Kansas City ranked top-12 in pass play percentage last season and just made Watkins the fifth-highest paid wideout in the league. He should get plenty of looks in our No. 8 graded offense from last year with Patrick Mahomes not afraid to move the ball downfield (9.8-yard aDOT so far this preseason). Watkins was also one of last year’s most efficient red-zone receivers, converting a whopping 70 percent of his red-zone targets into touchdowns (7 of 10). Watkins makes for a sound investment in the seventh round. If healthy, Cobb is tethered to one of the league’s top passing offenses and could smash his current ADP. Drafters may be currently experiencing some recency bias when it comes to Sanders’ somewhat disappointing 2017 campaign (fantasy WR60). He missed part of last year due to injury (four games), but prior to that, had 1,000-plus receiving yards in three straight seasons. He’s averaged 8.6 targets per game during that total time span. Denver’s addition of Case Keenum should help Sanders return to fantasy relevance once again. Anderson’s ADP already has legality concerns baked into it. He’s a fine buy at current cost that should produce flex-worthy weeks. I understand drafters being hesitant about selecting Nelson given his age, step down in quarterback play, and completely new environment he finds himself in for 2018. However, that doesn’t mean there isn’t value to be had when it comes to Nelson in fantasy this year. The Raiders under Jon Gruden present more questions than most teams, but there are 163 targets up for grabs for Nelson following Crabtree’s departure (101 targets). Nelson also has the size and athleticism to continue to be a factor in the red zone. I wouldn’t advocate taking Nelson at his ambitious Round 8 ADP, but he makes for a fine option at the Round 9/10 turn if you’re comfortable streaming him versus soft cornerback matchups. Volume still rules everything in terms of fantasy production, which is why Miami’s Stills makes this year’s list. The Dolphins led the league in pass-play percentage last year and have the second-most targets up for grabs in the league following the departure of Jarvis Landry. Stills stands to benefit from softer coverage with DeVante Parker likely drawing the opponent’s top cover man. Lastly, Stills finished last season ninth in air yards, with the offense clearly prioritizing getting him the ball deep down the field. While Nelson is a player I’m more comfortable taking a round later than ADP, I have zero qualms with anyone trying to take Lockett a round earlier. Doug Baldwin’s knee injury remains a concern, and if he were to have any setbacks, Lockett immediately stands to benefit the most with an influx of targets. Russell Wilson’s target pool isn’t the most talented bunch, but even Lockett at WR2 is head and shoulders above the next two receivers in line (Brandon Marshall, Jaron Brown). Lockett’s 4.40 speed combined with Wilson’s backyard-style football could be a lethal fantasy combination and I plan on investing heavily into it. I’m not sure there’s been a steadier drumbeat of positive news coming out of camp than that surrounding Miller. Miller seems to be doing all the right things and having a tremendous camp in the process. Chicago’s offense has been labeled by many fantasy pundits as the next Los Angeles Rams, in that many are expecting the entire offense to take a giant step forward under the new coaching regime led by Matt Nagy. Miller was a key addition to this offense at slot receiver and could very likely lead all rookie wideouts in receiving this year. On limited snaps last year, Godwin finished 28th in PPR points per opportunity, 17th in yards per target, and 13th in yards per route run. YPRR is one of our most predictive year-over-year statistic, indicating positive things for Godwin’s future. We’re also hearing he’s getting starter reps with the idea of moving DeSean Jackson into the slot when the team elects to go into 11-personnel. His 14th-round ADP indicates he’s essentially free in drafts. He’s one of the few locks for players I’m reaching for this year in drafts to secure he’s blossoming into a fantasy producer on my bench rather than my opponent’s.